According to a report by the U.S. Surgeon General, craniofacial injuries sustained during sporting activities are a major source of nonfatal injury and disability in children and adults, accounting for up to one-third of all sports injuries. 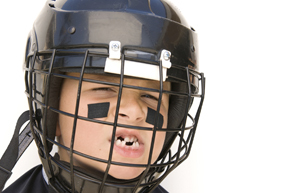 The National Youth Sports Safety Foundation estimates that more than 3 million teeth will be knocked out in youth sporting activities this year. The increasing participation of girls and young women in competitive sports means that they, just like their male counterparts, should know the risks of dental injuries and use additional protective gear as appropriate, Mitchell says. Mitchell says mouth guards and helmets with face protectors are the best way for kids to avoid dental injuries while playing sports. So what should you do if despite your best preventive efforts your child still hurts his or her teeth or jaw? If a tooth is broken or cracked, see a dentist within 24 hours, Mitchell says. If a tooth or teeth have been displaced or knocked out, Mitchell says, take the child immediately to the emergency room and to try to preserve the tooth. Avoid touching the root because it can be damaged easily. If the tooth is dirty, hold it by the upper part and rinse it off with milk until most of the dirt is washed away. If you don’t have milk, don’t clean it. Wiping it off may cause more damage. If your child is old enough not to swallow it, try to gently put the tooth back in its socket for the best chance of preservation. If you can’t get it back in the socket, put it in a cup of milk and head for the dentist or emergency room. Jaw injuries may be much less obvious than a broken or knocked-out tooth but they are no less serious, Mitchell says. If a child falls hard enough to cut their chin, or takes an especially hard hit, it could easily cause breaks in the jaw. In an injury such as this, a child should be seen by a doctor within 24 hours. No matter the injury, Mitchell says caring properly for the mouth afterward is key to successful healing.